Once you pick a style, make sure to specify it in your challenges. You cannot change styles once you've selected it (all difficulties must be done on the same style; you can change for x2 attempt though). Everyone can pick either style (regardless of when you started the challenge). Cannot use previously completed series; watching, on-hold, or dropped series are allowed. Exception: If you have watched a majority, and/or all of the TV for that category, then you are permitted to use OVA's, Movies and Ect. only after contacting Riho to discuss and verify you have no alternative. If you have watched literally everything available for that sports type, after checking and verifying with Riho, you may use another type of sports anime not listed instead. Miscellaneous cannot overlap with the other sports categories required. Includes (but not limited to) swimming, ping pong, football, volleyball, fishing, gymnastics, skating, etc. Combat includes (but not limited to) martial arts, boxing, kendo, sumo, judo, grappling, wrestling, etc. but must still be considered a sports genre series. Racing includes (but not limited to) track, bicycles, cars, etc. Unless the requirement states 'short'. Even if it was before the style #2 option became available. Other includes swimming, ping pong, football, golf, ice skating, gymnastics, dance, fishing. Anything not listed as "Main". Watch a series that isn't tagged with the schol genre: J League wo 100-bai Tanoshiku Miru Houhou!! [1.] Aim for the Ace! [5. ]New Prince of Tennis/Shin Ace wo Nerae! Permission from @riho88riho to used the 'leftover' series for the other difficulty levels I am currently participating in due to the Sports Challenge styles and criteria being changed from 3/4/5 series to 2/3/4 series, etc. 'Leftover' series will be marked as * and a link that redirect you to the original post. Watch an anime that has a non-Japanese title: Free! Watch a series that isn't tagged with the School genre: Keijo!!!!!!!! Watch a short OVA (episodes are 10min or less) ➝ Kaichuu! Watch a TV combat anime ➝ Maken-Ki! Watch a TV "other" anime ➝ Keijo!!!!!!!! Watch a series that isn't tagged with the drama genre ➝ Cheer Danshi!! All titles used in this easy version were watched before posting this. [✓] Watch an anime one-cours (or more) in length Free! [4.] Sekai de Ichiban Tsuyoku Naritai! [X] Sekai de Ichiban Tsuyoku Naritai! Watch a soccer, volleyball, or tennis movie. Watch a basketball, gymnastics, or racing movie. Watch an OVA with 5+ episodes. Watch a baseball or volleyball OVA. Watch a tennis or basketball OVA. Watch a racing or combat OVA. Watch a baseball or volleyball special. Watch a basketball or tennis special. Watch a baseball or swimming movie. Watch a soccer, volleyball, or tennis movie. Captain Tsubasa: Ayaushi! Zen Nihon Jr.
Watch a tennis or basketball OVA. Kuroko no Basket: Baka ja Katenai no yo! Watch a series with more than 80k members Ping Pong The Animation / Haikyuu!! Note: The anime listed in orange are the ones that are NOT previously seen. [X]	Watch a soccer, volleyball, or tennis movie. [X]	Watch a basketball, gymnastics, or racing movie. [X]	Watch an OVA with 5+ episodes. [X]	Watch a tennis or basketball OVA. [X]	Watch a racing or combat OVA. [X]	Watch a basketball or tennis special. [X]	Watch an "other" special. [✓]	Watch an anime one-cours (or more) in length Taishou Yakyuu Musume. [✓]	Watch a soccer, volleyball, or tennis movie. Captain Tsubasa: Asu ni Mukatte Hashire! [X]	Watch a baseball or swimming movie. [X]	Watch a baseball or volleyball OVA. [X]	Watch a baseball or volleyball special. [✓]	Watch a TV combat anime Keijo!!!!!!!! [3. ]Sekai de Ichiban Tsuyoku Naritai! [X] Watch a TV tennis anime: Ace wo Nerae! [✔] Watch a TV "other" anime: Cheer Danshi!! [✔] Watch an anime that has a non-Japanese title: Long Riders! [✔] Watch a baseball or volleyball OVA: Haikyuu!! : vs "Akaten"
[✔] Watch a TV "other" anime: Anima Yell! [✔] Watch an anime that has a non-Japanese title: Dive!! [✔] Watch a series that isn't tagged with the comedy genre: Minami Kamakura Koukou Joshi Jitensha-bu: Kita yo, Taiwan! ✔	Watch a tennis or basketball OVA. - Kuroko no Basket: Baka ja Katenai no yo! ✔	Watch a series with more than 80k members - Free! ✔	Watch a series that isn't tagged with the school genre - Ginga e Kickoff!! Watch a racing or combat OVA. 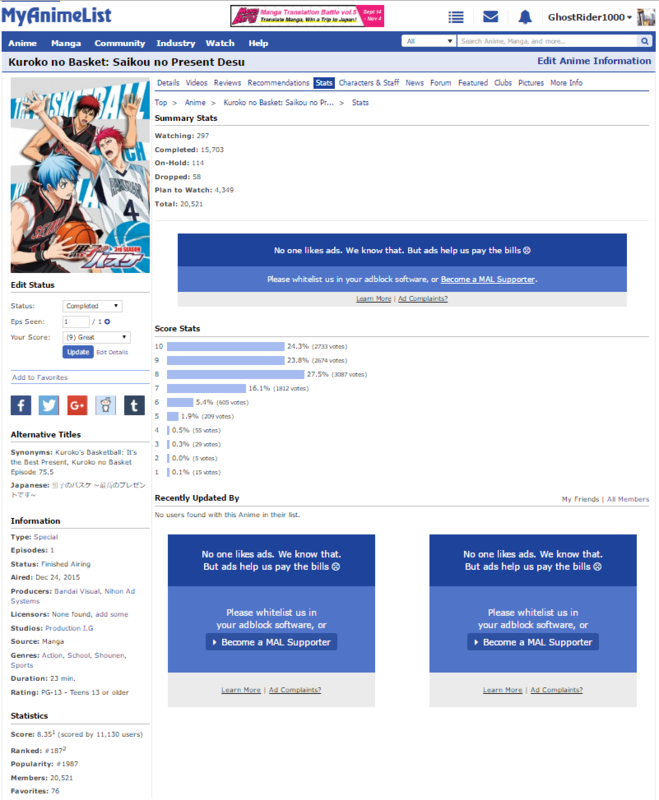 "Eiji"
Watch a series with more than 80k members Haikyuu!! -- [X] Watch a soccer, volleyball, or tennis movie. -- [X] Watch an OVA with 5+ episodes. -- [X] Watch a baseball or volleyball OVA. -- [X] Watch a racing or combat OVA. -- [X] Watch a baseball or volleyball special. Watch a tennis or basketball OVA: Kuroko no Basket: Baka ja Katenai no yo! Watch an anime two-cours (or more) in length: Haikyuu!! Watch a series with 25k-80k members: Sekai de Ichiban Tsuyoku Naritai! Watch an anime one-cours (or more) in length: Keijo!!!!!! Watch a series that isn't tagged with the comedy genre: All Out!! [*] Watch a soccer, volleyball, or tennis movie. [*] Watch a baseball or swimming movie. [*] Watch an OVA with 5+ episodes. [*] Watch a baseball or volleyball OVA. [*] Watch a tennis or basketball OVA. [*] Watch a racing or combat OVA. [*] Watch a baseball or volleyball special. [*] Watch a basketball or tennis special. [*] Watch an "other" special. [*] Watch a series that isn't tagged with the shounen genre - All Out!! [X] Watch a baseball or swimming movie. [X] Watch an OVA with 5+ episodes. [✔] Watch a tennis or basketball OVA. Kuroko no Basket: Baka ja Katenai no yo! [X] Watch a baseball or volleyball special. [X] Watch an "other" special. [✔] Watch an anime two-cours (or more) in length. Haikyuu!! [✔] Watch a series that isn't tagged with the shounen genre. Free! .Cannot use previously completed series; watching, on-hold, or dropped series are allowed. .Miscellaneous cannot overlap with the other sports categories required. Includes (but not limited to) swimming, ping pong, football, volleyball, fishing, gymnastics, skating, etc. .Combat includes (but not limited to) martial arts, boxing, kendo, sumo, judo, grappling, wrestling, etc. but must still be considered a sports genre series. .Racing includes (but not limited to) track, bicyles, cars, etc. [X] Watch a soccer, volleyball, or tennis movie. [X] Watch a basketball, gymnastics, or racing movie. [X] Watch a baseball or volleyball OVA. [X] Watch a tennis or basketball OVA. [X] Watch a racing or combat OVA. [X] Watch a basketball or tennis special. •	Watch a tennis or basketball OVA. Kuroko no Basket: Baka ja Katenai no yo! •	Watch a TV "other" anime Free! •	Watch a series that isn't tagged with the comedy genre Cheer Danshi!! [1.] Sekai de Ichiban Tsuyoku Naritai!